LONDON'S labyrinth of tunnels is the greatest in the world. Layer upon layer the great steel tubes pierce the city’s foundations in every direction. Modern methods and machinery have placed the driving of London’s steel tunnels among the exact sciences. Headings driven simultaneously from a number of vertical shafts meet precisely at the points assigned by the engineers. Air-locks, electric and pneumatic drills and excavators, hydraulic rams and other equipment of the engineer have all combined to speed up tunnelling far underground. The driving of tunnels under the River Thames now presents far fewer difficulties than were experienced by the pioneers of a century ago. There is one tunnel under the Thames, through which fast electric trains now run, that calls for more than a passing word. This is the famous Thames Tunnel, linking Wapping with Rotherhithe, and begun more than a century ago. The story of this achievement, undertaken without the mechanical aids of to-day, ranks as an epic in the annals of pioneer engineering. The man who built the Thames Tunnel was Marc Isambard Brunel. Brunel was born in Normandy in 1769, and in 1793 he fled to America from the French Revolution. Later he came to England as an engineer and inventor of note, and in 1799 he married an Englishwoman. Their son was Isambard Kingdom Brunel, who later became the famous railway engineer and builder of the wonderful steamship Great Eastern. The elder Brunel first set his mind to the building of a tunnel beneath the Thames in 1820, but the project had been attempted twice before that time. The first tunnel, from Gravesend to Tilbury, was projected by Ralph Dodd, a noted engineer, in 1799, but the scheme had to be relinquished. The second tunnel, however, was carried a considerable distance before it was abandoned. It may well be regarded as the forerunner of Brunel’s tunnel and is interesting because of its engineer, Richard Trevithick, and because of the events that led to its failure. Richard Trevithick, a giant Cornishman, of unusual physical strength, is remembered best for his work in connexion with high-pressure steam. He has justly been described as “the father of the locomotive”. Trevithick’s tunnel was planned to link Rotherhithe with Limehouse, and in 1804 Parliamentary sanction to begin building was granted to the Thames Archway Company. EXAMINATION FROM A DIVING BELL was often carried out by Marc Isambard Brunel during the building of the Thames Tunnel. The instability of the river bed caused frequent trouble and on one occasion Brunel was able to thrust a rod into the roof of the tunnel from the diving bell, so loose was the composition of the river bed. In many places the river bed had to be strengthened with deposits of clay and gravel. Work was begun shortly afterwards under the direction of Trevithick and a fellow Cornishman named Vasey. The first operation was the sinking of a shaft, 11 feet in diameter, at a distance of about a mile below Rotherhithe Church a hundred yards from the river. Continuous pumping was necessary during this work to clear drainage water. After a depth of 42 feet had been reached, the shaft was reduced in diameter to 8 feet, and excavation was then carried on to a depth of 76 feet. All this work was done by pick and shovel in the heavy loam and London clay, with hand windlasses and baskets to remove the spoil. In all probability the pumps also were worked by hand. At the foot of the shaft the Cornish miners drove out a heading under the river. This excavation, or driftway, as it was termed, was 5 feet high, 30-in wide at the top, and 3 feet wide at the bottom. It was intended to enlarge the tunnel later for the passage of carts and foot passengers. The work progressed at the rate of from 4 to 10 feet a day, and after some eighteen months the heading had reached a point more than 1,000 feet from the shaft at Rotherhithe. Unfortunately the question of cost had to be borne in mind and the working depth was inadequate. Despite the fact that the top of the tunnel was between 25 and 30 feet below the river bed, the heading was twice crushed in under the pressure of high tides. It is related that when the workings were within a short distance of Limehouse, an inspector of the Thames Archway Company casually remarked that the heading had deviated a trifling amount from the direction laid down in the plans. Trevithick, having overheard the comment, construed it as a reflection on his skill as an engineer, and ordered a boatman to row to a spot at which shore bearings indicated the planned centre line of the tunnel. Trevithick then entered the tunnel with a number of workmen and through the shored-up roof of the heading he pushed in succession a number of jointed rods. The appearance of the topmost rod above water would be noted by the waiting boatman, and so a check could be made on the alignment of the tunnel. Unfortunately, delay in fitting the rods together, combined with the disturbing of a roof which was far too thin, caused the Thames to break through. Trevithick and his men had to race for the safety of the shaft, and the tunnel was flooded. It is difficult now to vouch for all details of this account, but it is certain that over fifty leading engineers of the day agreed that it was impracticable to build a Thames tunnel large enough for commercial purposes. Trevithick’s attempt had to be abandoned, and for another fifteen years the bridges of London and the ferry boats below the Pool knew no rival. But Trevithick's work beneath the river was yet to serve as a guide for his successor, and his high-pressure steam engine was to prove of the greatest assistance in gaining the final victory. Marc Isambard Brunel, after several months of careful planning, submitted his proposal to the British public in 1823. His scheme involved the building of a double roadway under the Thames between Rotherhithe and Wapping. 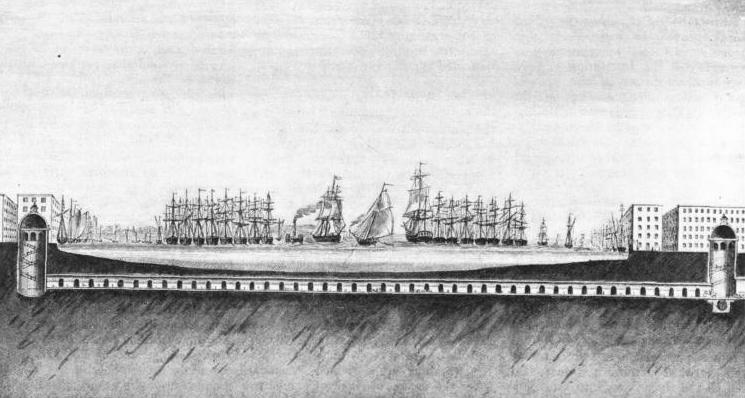 Brunel explained the methods he intended to adopt in building the tunnel and stated that no preliminary heading would be driven: the full-bore excavation would be made at the outset. The project aroused enormous interest and, with the support of the Duke of Wellington, the Thames Tunnel Company was formed by an Act of Parliament that received the assent of King George IV on June 24, 1824. The authorized capital was £200,000, provision being made for a permissible addition of £50,000. Work was begun on March 2, 1825. In accordance with Trevithick’s precedent, the starting point was a short distance from Rotherhithe Church. About fifty yards from the river bank numbers of concentric rings of wooden piles were driven into the ground. Inside the innermost ring was placed an iron-shod wooden curb 50 feet in diameter. ON this massive curb Brunel built a cylinder of brick and cement, 42 feet high, with walls 3 feet thick. The cylinder was strengthened with iron rods and bands and weighed over 1,000 tons. On top of the cylinder a steam engine was erected to work water pumps and the bucket chain used for raising the earth from the excavations. Inside the cylinder the earth was dug away and 1,000 tons of brickwork sank slowly into the ground. 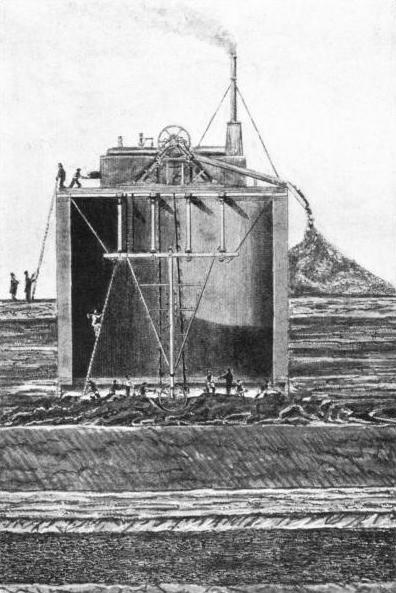 A quicksand, 26 feet deep, was successfully negotiated by the cylinder, which was finally sunk to a depth of 65 feet. Brickwork was added to the top of the cylinder as it dropped below ground level. The next job was the sinking of a well, 25 feet. in diameter, at the bottom of the main shaft, to serve as a sump for the drainage pumps. At a distance of 63 feet below the surface the driving of the main tunnel was begun and the heading was driven downwards at an incline of 1 in 44. The declivity was necessary to afford sufficient headroom below the deepest part of the river, in accordance with the lesson learnt from Trevithick. For the excavation of the tunnel, Brunel introduced his famous shield - forerunner of the wonderful devices that have drilled the tunnels for London’s tube railways. It is said that Brunel conceived the idea of the shield after having observed the borings of a teredo worm in a piece of wood. The original Brunel shield consisted of twelve cast-iron frames, each 22 feet high and 3 feet broad. Every frame was divided into three compartments, so that the complete shield contained thirty-six divisions for that number of miners who worked at the front of the shield and cut into the wall of earth before them. As the earth was cut away from the front of the shield alternate sections were moved forward by powerful screws (not by hydraulic jacks as in modern practice), abutting against the solid brickwork of the completed portion of the tunnel. From the back of each compartment bricklayers added to the lining of the tunnel as the miners carried out their digging at the front. SINKING THE SHAFT AT ROTHERHITHE. Work began on March 2, 1825. A cylinder was built of brick and cement, 42 feet high and with walls 3 feet thick. It was strengthened with iron and weighed more than 1,000 tons. Inside the cylinder the earth was dug away so that the whole cylinder gradually sank to form the shaft from which the tunnel was driven. On top of the cylinder was a steam engine to work the pumps and bucket chain. Every frame was carried on a screw jack attached by a ball-and-socket joint to a massive cast-iron shoe resting on the tunnel floor. At the top of each frame were two “staves” or inverted cast-iron troughs, each 1 ft 6-in wide and 9 feet long. Their function was to support the roof until completion of the brickwork. Staves as well as shoes were provided with sockets to take the thrust of the screws used for driving the frames forward. The front edges of the staves and frame platforms were wedge-shaped to facilitate their forward movement into the earth. At this stage the complete shield can be visualized as a huge “potato chipper” held horizontally, with openings that would produce a “chip” about 7 feet by 3 feet in section. These were the days before the use of compressed air, and Brunel’s problem was to prevent the wet earth from falling into the shield openings and killing the miners. He over came the difficulty by the use of a cross panelling of boards, called polling boards, 3 feet long and 6-in wide. The ends of each polling board were held in front of the frame by a pair of screw jacks. These were slackened back for the removal of one or more boards as required during digging, and so only a small area of the wet earth face was exposed at a time. When the tunnellers eventually reached soil of an extremely fluid nature, additional precautions became necessary. The pollings were then attached to one another and to the shield by hooks and were also strengthened by iron spurs resting against the front of the floor plates and driven into the ground. The whole system of polling boards became a Venetian blind on the grand scale. The shield was placed in position at the bottom of the Rotherhithe shaft on January 1, 1826, and the driving of the great double archway began. By April 27, 1827, the tunnel had advanced 540 feet, but on that day panic seized the miners and the bricklayers, and they fled from the shield and from the peril of the river above them, without even having secured their polling boards. New men were engaged and the tunnel crept forward another ten feet. On May 18 the river burst into the heading and sent the men flying for their lives to the shaft. The men narrowly escaped, but the tunnel was completely flooded. Brunel took soundings of the river above his tunnel and gave orders that thousands of small bags of clay, with 4-feet rods of hazel attached, should be dumped from barges into the cavity in the bed of the Thames. The clay bags, with many tons of loose gravel, were forced into the opening by successive tides. Then steam pumps were used to pump the tunnel dry again. THE brickwork was found intact and the work went on. When the tunnel had attained a length of 600 feet another irruption of the river took place, despite heroic efforts by the tunnellers to avert a disaster, in which six men were drowned. Once again Brunel had to repair the river bed and over 4,000 tons of soil were required to fill the chasm. Again the tunnel was pumped dry and, although the brickwork was undamaged, the shield was found to have been badly strained and its supports fractured. The Thames Tunnel Company was now in a serious position. Of the £144,000 paid by shareholders, £140,000 had been spent, and for seven years the workings lay idle and deserted. After the raising of Exchequer bills to the amount of £300,000, work was resumed in March 1836 with a new and stronger shield, which weighed 180 tons. In the anxious months that followed several serious irruptions of earth and water had to be countered, and from 1837 to 1839 the workings were frequently filled with gas. The trouble with gas included frequent bursts of sulphuretted hydrogen, and from its effects the work men often fell senseless at their posts. The soil also, at the centre of the river, became so fluid that the top compartments of the shield had to be closed with timbering until means had been devised, in addition to the polling boards, to enable the workers to proceed. In face of these difficulties with gas and the fluid state of the soil, the tunnel had sufficiently advanced early in 1841 to make the final triumph a certainty. On March 24, 1841, Marc Isambard Brunel was knighted by Queen Victoria and in the following August the great engineer had the satisfaction of entering the tunnel from a small heading that had been driven from a shaft on the Wapping side of the river. THE COMPLETED TUNNEL is formed of two horseshoe-shaped parallel passages each 16 feet high and 13 ft. 9 in. wide. The central dividing wall is 3 ft. 6 in. thick at the top and 4 feet thick at the bottom The Thames Tunnel was opened for pedestrian traffic on March 25, 1843, after nine working years. It cost £446,000. nearly three times the original estimate. The Thames Tunnel was opened for foot passengers on March 25, 1843, after nine working years had been spent upon it at a cost of £446,000. The engineer’s original estimate for the completion of the tunnel was £166,000. The cost of the steam engine and pumps at the shaft was computed at £4,000. The cost of tools and implements was estimated at £6,000, and £3,300 was allocated for the building of the original shield. The second, and more substantial shield, cost about £7,000, and after the completion of the tunnel it was exhibited at Rotherhithe, for a small charge, for about two years. At a later date it was broken up and disposed of as scrap metal - an unworthy end for this wonderful pioneering device of tunnellers all over the world. It is said of Sir Marc Brunel that the strain and anxiety entailed in building the tunnel brought on an attack of partial paralysis, but the engineer recovered sufficiently to attend the opening ceremony. It was close to the scene of his father’s triumph that Sir Marc’s son, Isambard Kingdom Brunel, broke down under the many unsuccessful attempts that were made years later before the launching of the famous steamer Great Eastern. In section the tunnel consists of a mass of brickwork 38 feet wide and 22 ft 6-in high. The passages within the brickwork comprise two parallel arched tunnels of horseshoe form, each 16 feet high and 13 ft 9-in wide. Between the archways the central dividing wall is 3 ft 6-in thick at the top and 4 feet thick at the bottom, where an inverted arch, 3 feet thick, serves to support the outer walls and to strengthen the central division. At regular intervals along the passages are additional strengthening arches. The foundations were laid on massive planks of beech, and the weight of the shield in passing over the tunnel floor so compressed the earth that in no instance was there any failure of the foundations. Each passage was provided with a footway and a carriage road, but the inclined approaches for vehicles were never built. The passageways were originally linked by sixty-three small arches and were lighted by gas. 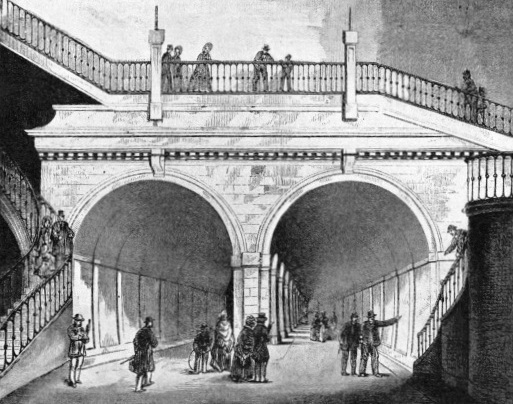 Pedestrians entered the tunnels by a spiral staircase at either end and paid a penny toll, but the undertaking was not a commercial success and it was sold to the East London Railway in 1865 for £200,000. SHORTLY afterwards it was put into service as a railway tunnel for the trains of the East London Railway running between Liverpool Street and New Cross and other South London stations. Through electric trains of London Transport now run between Hammersmith and New Cross or New Cross Gate, on the main line of the Southern Railway, by way of Liverpool Street and the Thames Tunnel. Brunel’s original tunnel is often confused with a later tunnel in the neighbourhood. This is the Rotherhithe Tunnel, opened in 1908, for vehicles and foot passengers. Its length is a mile and a quarter. It runs from Neptune Street, in Rotherhithe, and crosses the Thames below the Thames Tunnel. The Rotherhithe Tunnel comes to an end in Horseferry Branch Road, in Shadwell, near the Regent's Canal Dock. The Blackwall Tunnel, opened in 1897, is farther down the river. This tunnel, also for vehicles and pedestrians, runs from Poplar, on the north bank of the Thames, to Blackwall Lane, in East Greenwich. Including the approaches, the Blackwall Tunnel is 6,200 feet long, 1,220 feet of this length being under the Thames. The tunnel is a double iron tube, 27 feet in external diameter, and is lined with concrete. Its cost was £871,000 or, with the approaches, £1,265,000. Another tunnel from the north bank of the Thames to Greenwich is the Greenwich Tunnel, a subway for foot passengers only. This subway, crossing the river from the Island Gardens, at the southern end of the Isle of Dogs, was opened in 1902. The London borough of Woolwich has interests on both banks of the Thames. For many years Woolwich and North Woolwich have been connected by a free ferry. This ferry is occasionally suspended because of fogs. To obviate the inconvenience caused by such suspension, the Woolwich Tunnel was opened in 1912. This is a subway for foot passengers. Its length is 327 yards. An ambitious scheme has been inaugurated for a tunnel much lower down the river, to connect Dartford, in Kent, with Purfleet, in Essex. SECTIONAL DIAGRAM OF THE THAMES TUNNEL built by Marc Isambard Brunel, who was knighted in 1841. The tunnel runs under the River Thames between Rotherhithe and Wapping. Pedestrians entered the tunnel by a spiral staircase at either end. The tunnel was closed in 1871 to pedestrian traffic, but it is used to-day by electric trains.